US-based dermatologist, researcher and international educator Dr Hema Sundaram discusses her passion for teaching, science and patient safety. With two hard-working biochemists as parents, it would have been difficult for young Hema Sundaram to be anything but interested in research and science. “I was born in the US but my parents moved to the UK when I was about two months old and this is where I grew up. My family was continuously focussed on research during my childhood and, as you can imagine, there was a lot of scientific talk at the dinner table! So, from a young age I was surrounded by science and taught to think analytically,” explains Dr Sundaram. Even before she attended medical school at Cambridge University, Dr Sundaram was passionate about this area. “I finished school a little early, took a year off and did full time research in a lab and I continued to do research throughout my undergrad degree, at medical school and thereafter,” she recollects, adding, “For me, research was, and still is, a very important part of what I do.” Dr Sundaram became interested in dermatology while writing a thesis on molecular biology for her degree in genetics. 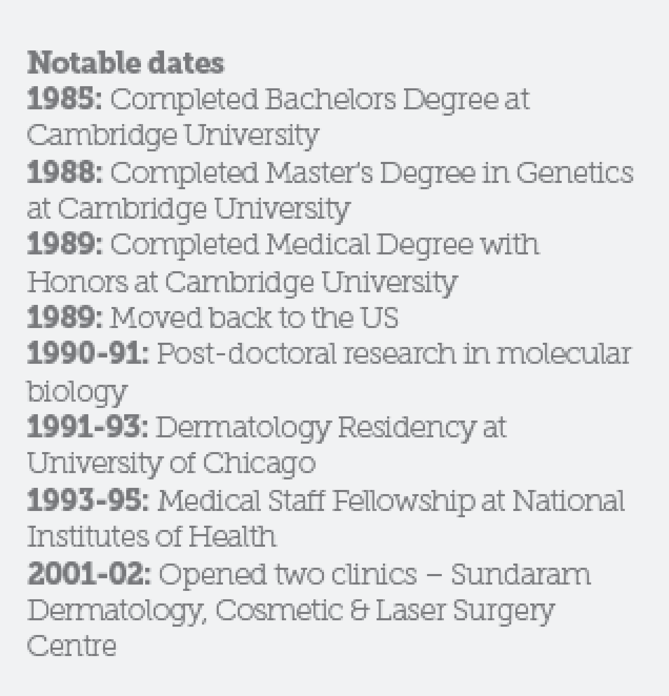 But, it wasn’t until she moved to the US with her husband and undertook a dermatology residency at the University of Chicago that she became interested in minimally-invasive aesthetic procedures. 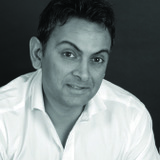 “I realised how aesthetic procedures transformed the way patients felt on the inside, as well as the outside. The difference it made to their self-confidence was a revelation. I also discovered that I like doing things with my hands. I love the idea of using your intellect for taking a patient history, performing a clinical examination and formulating a treatment plan, while also using your hands as a tool to achieve a positive outcome,” she explains. “As soon as I had this epiphany, I knew that procedural dermatology was what I wanted to do for the rest of my life,” Dr Sundaram says. Dr Sundaram also loves the challenge of determining the best treatment plan for patients. “This field is a wonderful and challenging opportunity. We have to select the most appropriate technologies on an individual basis for each patient and this relates back to science. We need to understand the science in both the ageing process and how the products work. A great part of my research is focussed on eludicating the science of current and emerging aesthetic technologies, and in leveraging scientific understanding to develop new technologies that improve patient results or safety. 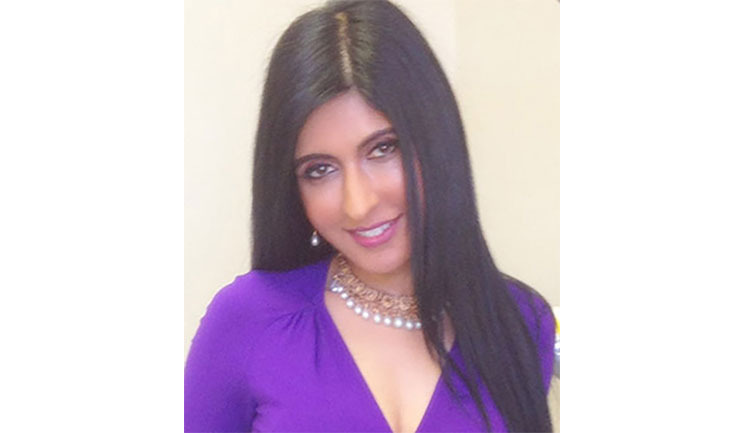 The key to advancing aesthetic and procedural dermatology is to think like a scientist.” When discussing what treatment modality she appreciates most, Dr Sundaram states, “I think the best approach is to use multiple modalities to treat each patient individually. Since we know that ageing is a multifactorial process, it makes sense logically that we address it with multiple treatment modalities,” she explains. As well as a passion for science, teaching plays a significant role in Dr Sundaram’s professional life. She explains, “I remember my first ever conference talk was on the aesthetic and therapeutic applications of botulinum toxin. I found speaking at conferences to be a very inspiring experience. I have realised since then that to master and understand any concept you must teach it to others. I also find it exhilarating to present; to be able to communicate quite complex concepts to an audience and have them understand is a great experience for us as educators.” Dr Sundaram has since taught and lectured across the globe at universities, academy training courses and international conferences. From her travels, Dr Sundaram has recognised that there is a global need to monitor procedural safety and practitioner qualifications. 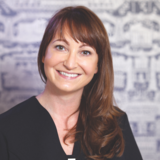 “I am involved in initiatives to improve procedural safety and outcomes through the American Society for Dermatologic Surgery (ASDS), and the Global Aesthetics Alliance (GAA), which brings together key opinion leaders from throughout the world,” she explains. The balance I have in my practice between the aesthetic and therapeutic procedures. As a dermatologist, both aspects of patient care are important. A wise plastic surgeon once told me that I should not be afraid to say no and not to overextend myself. It’s important to appreciate that we can’t be everywhere. What’s your biggest life achievement? To have balanced my career with my family life. I didn’t accept a single commitment that involved travel until my family and I felt my children were old enough. I hope I have helped a little to create understanding of how relevant science is to what we do every day in our clinics. I always aspire to make science understandable and to make it exciting to those who are not scientific nerds, as I am! 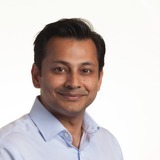 Dr Sundaram will present at the DHAT session at the Elite Training Experience at ACE 2018 in London on April 27.